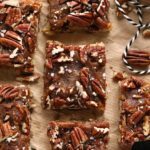 If you are looking for some almond flour recipes for the holiday season, these Peppermint Pretzel Bars are easy to make, gluten, free, and absolutely delicious! 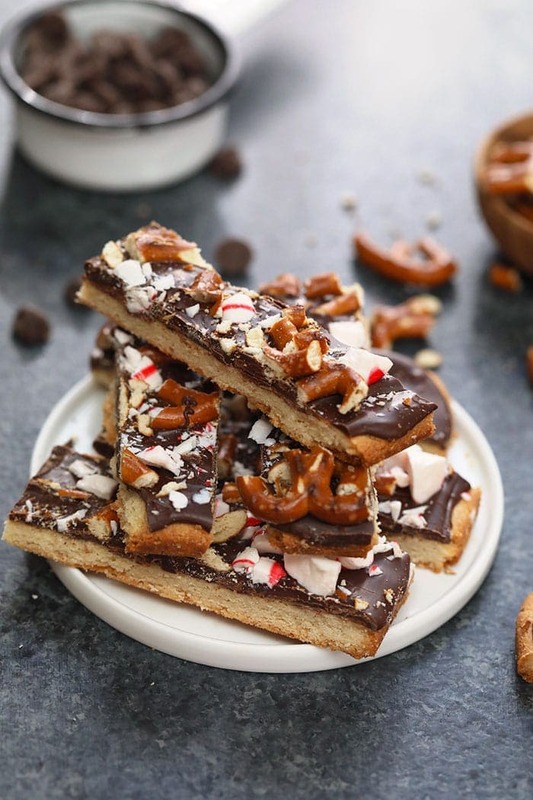 These peppermint pretzel bars are are a yummy combination of chocolate peppermint bark and almond shortbread crust. Add them to your holiday cookie list! It’s official, we can now listen to Christmas music all day, every day until Christmas Day. I’m not going to lie, I did listen to Christmas music while I tested holiday recipes back in October. Just to get in the mood, ya know? Yes, sometimes the holidays can be a commercial nightmare and I try my best to have a little balance when it comes to all things holidays. I love nesting when winter rolls around in Minnesota. The holidays are my time to do some winter cleaning and then nesting. For me, that is decorating for the holidays. Turning down the lights in the evening, turning on the Christmas lights, and cozying up on the couch with a good book. The hustle and bustle of the holiday season is balanced out with my nesting. Another nostalgic holiday stress reliever is BAKING. 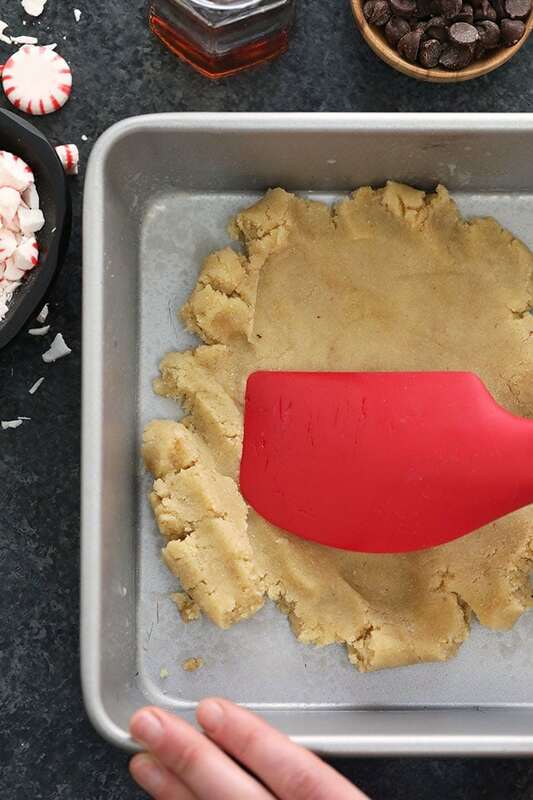 Sign me up for holiday baking any day. 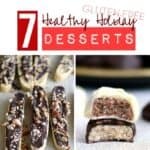 We have so many delicious holiday recipes on FFF, but today I wanted to chat about our healthy dessert almond flour recipes! 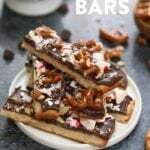 These peppermint pretzel bars have the most delicious almond flour shortbread crust layered with a classic chocolate peppermint bark with pretzels. 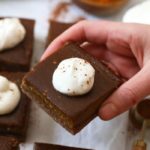 They are gorgeous, easy to make, and so delicious! We used almond flour for a couple of reasons. We love the taste and it is a great gluten free option when it comes to baking and cooking. 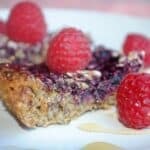 People are perusing FFF for grain free and gluten free recipes more and more. So here we go! 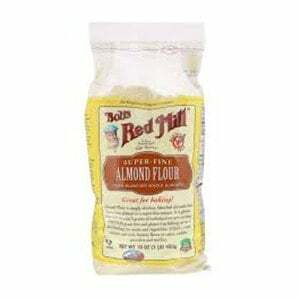 Do you have questions about almond flour baking and cooking? So does everyone else. 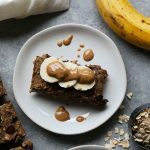 Can I use almond flour instead of regular flour? All flours are so different. You are not able to substitute almond flour for any other flour without altering the whole recipe. I would always search for a recipe that uses the exact flour you are using, rather than trying to substitute flours. The moisture absorption for flours is so different across different types of flours. What are the benefits of almond flour? Almond flour allows you to cook or bake with a gluten free and grain free option! It is great for baking and works as a bind in soups or sauces. Yes! Almond flour is high fat and low in carbs. 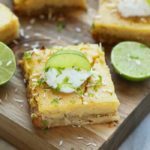 It is the go-to flour for the keto diet! Is there a difference between finely ground almond flour and almond meal? Yes, there is a difference. Be sure to check your recipe ingredients before heading to the grocery store! 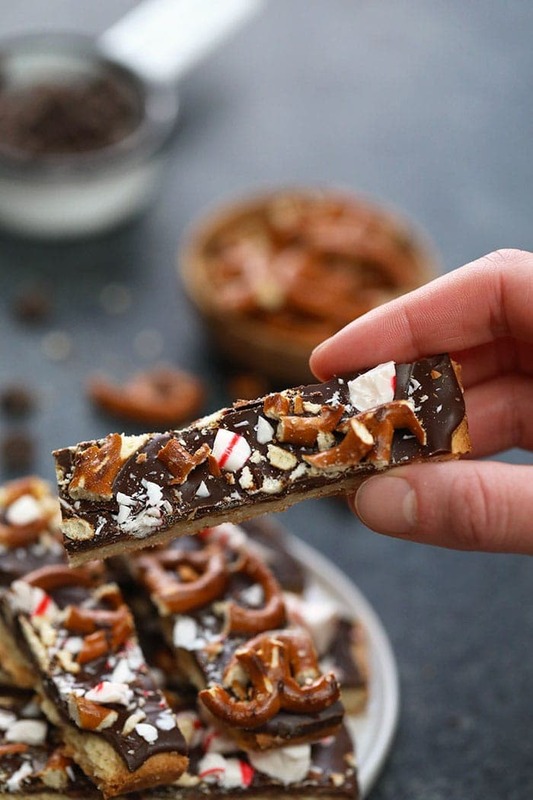 Now, get your apron on and start making these Peppermint Pretzel Bars. 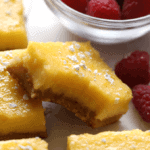 Need more almond flour recipes? Scroll down for some of our favorites! 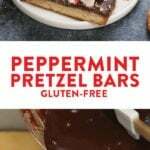 If you are looking for some almond flour recipes for the holiday season, these Peppermint Pretzel Bars are easy to make, gluten, free, and absolutely delicious! 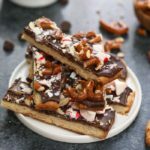 These peppermint pretzel bars are are a delicious combination of chocolate peppermint bark and almond shortbread crust. Add them to your holiday cookie list! 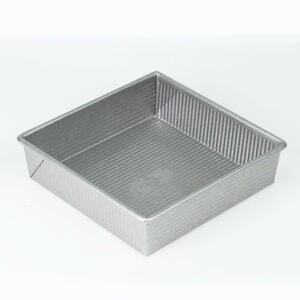 Preheat the oven to 350ºF and line an 8×8 inch pan with parchment paper or spray with non-stick cooking spray. Set aside. Mix all ingredients for the crust in a medium-sized bowl. Mix together and then use your hands to form a ball with the dough. 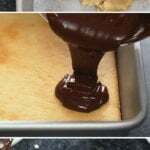 Place ball in the greased 8×8 pan and flatten to the bottom of the pan with your hands or a spatula. Place into the oven and bake for 10-12 minutes or until golden brown. Remove from the oven and let cool completely. Set aside. Place chocolate chips and coconut oil into a microwave safe container. Heat on high for 30 second intervals (stirring in between intervals) until chocolate chips are melted. Stir until smooth. 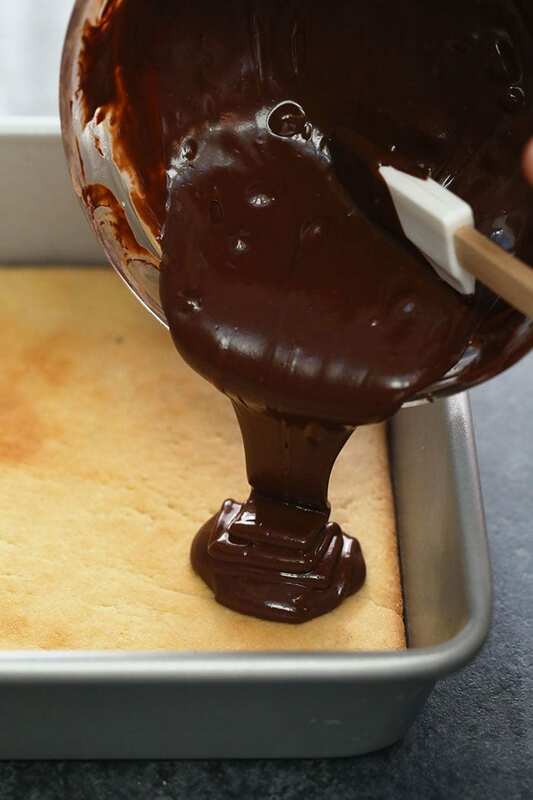 Pour melted chocolate over crust and evenly spread the chocolate to the outer edges of the crust with a spatula. 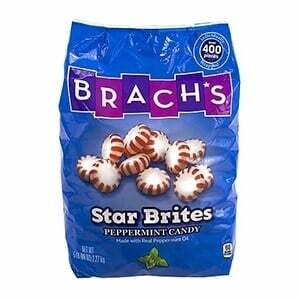 Sprinkle chopped pretzels and crushed peppermints over the top of the chocolate. 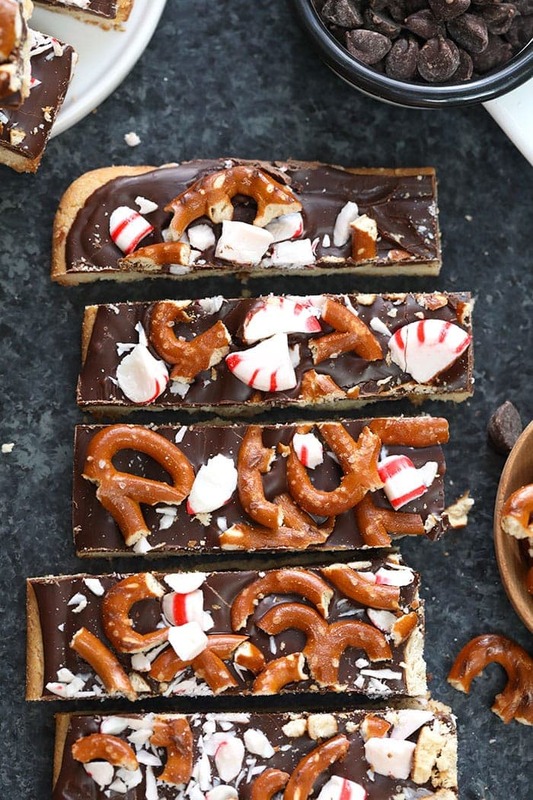 Place peppermint pretzel bars into the freezer for 5 minutes to let the chocolate set*. 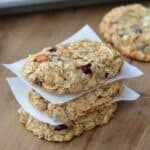 Remove from the freezer and remove bars from the pan by carefully lifting parchment paper straight out of the pan and on to a cutting board. Cut into pieces and serve. Place in the freezer to set for 5 minutes so that you can cut into bars. Do not freeze the bars completely or bars will be difficult to cut.